If you or your parents think rats are disgusting, read on! You (or your parents) probably think that rats disgusting, filthy, and/or carry diseases. These things may be true about wild rats, but all of it is false for domestic rats. Forgot about everything you've learned about rats and read on with an open mind. Domestic rats certainly are not disgusting, filthy, and don't cary disease. Wild rats may carry diseases, but then again all wild animals can carry diseases. Domestic rats are actually very clean animals. They clean themsleves amy times a day like cats. And they are odorless, unless of course you forget to clean its cage. Now that the rumors are cleared, I can tell you about the good points of rats. Rats make excellent pets and are great first pets for children. Let's list out the reasons why. Rats are social animals. Most small animals are anti-social. This means that they don't like to be held and can't bond with people, resolting in biting. Rats, on the other hand, love people. They actually need human companionship and can create a loving bond with their humans. Rats rarely bite, and the only reason they would bite is if you smelled like food and it thought you were feeding it. Rats also enjoy riding in pockets and on shoulders. Rats are very intelligent. They are as smart as or smarter than dogs. They are easily trained and canbe taught numerous tricks. They can even learn to come when you call their name. Litter training is also something they can learn very quickly. Rats are fairly easy to keep. All they really need is a big enough cage to live in, bedding, a place for them to sleep, a food dish, a water bottle, and some toys. All of this, including the rats, should cost somewhere around $120. The most you willneed to spend on food and bedding each month is $20. It's not hard to find food for them because they are omnivores and will eat anything you give them. Rats make great pets for children. They are very docile and will only bite if they are mistreated. So be sure your kids don't squeeze they rats, pull their tail, tease them, or feed them through the bars of their cage. Follow these rules and the rats will bond quickly with your children. Rats are very fun to keep. They aren't a pet you just sit around and watch. They thrive on human comoanionship. 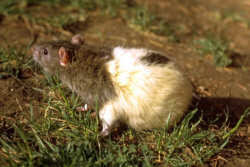 Just like dogs, rats are very energetic and playful. They are also very sweet and enjoy cuddling with people. Now that you know how great of pets rats are, read through the rest of the site to find out how to take care of them.